It’s often considered “the forgotten cancer.” Sarcoma is a tumor that occurs in the bones and soft tissues such as fat and muscle. There’s a lot we don’t know about sarcoma, including the cause. We learn about the symptoms of sarcoma, how it’s treated and more from Dr. Colette Pameijer, a surgical oncologist at Penn State Health Milton S. Hershey Medical Center. Description – The video begins inside an office at Penn State Health Milton S. Hershey Medical Center. Two people are standing next to each other looking at the camera. From left to right is, Scott Gilbert and Collette Pameijer. Scott Gilbert – From Penn State Health, this is ‘Ask us anything about Sarcoma’. I’m Scott Gilbert. Sarcoma is a tumor that occurs in the bones and soft tissues such as fat and muscle. There’s a lot we don’t know about Sarcoma including the cause. But July is Sarcoma awareness month and today will learn about the symptoms of Sarcoma, how it’s treated, and much more from Doctor Collette Pameijer. She’s a surgical Oncologist here at Penn State Health Milton S. Hershey Medical Center. Doctor Pameijer, thanks so much for your time today. Let’s start with the very basics because we don’t hear a lot about sarcoma. Some people call it the forgotten cancer. It accounts for a relatively small percentage of all cases of cancer, right? Dr. Collette Pameijer – That’s absolutely true. Sarcomas affect only– or constitute only 1% of all adult malignancies. A higher percentage of pediatric malignancies, but they’re very uncommon. I think another issue with sarcoma is that they know no bounds. So, they affect men, women, older people, younger people. there’s no set demographics so there’s no real, you know, rallying call. That there’s no group of people that you can focus on. It’s just anyone. Scott Gilbert – And so, and they occur in fat, muscle, connective tissues. I guess you could say in places where other cancers don’t. Dr. Collette Pameijer – That’s absolutely true. Most of the cancers that affect adults affect some sort of lining tissue. So, breast cancer is the lining of the breast, lung cancer is the lining of the lungs. And I think those cancers are more common because those lining tissues turn over all the time. We actually shed the linings of the lung and the colon and all of that all of the time. You don’t ever shed your muscle. Unfortunately, we don’t shed our fat either. But bone, nerve, those– whatever you’re born with, that’s what you have. And I think because there’s really no turnover, the rate of having cancer in those tissues is so much lower but then that makes them extremely uncommon. But any structural tissue of the body can potentially turn into a sarcoma. Scott Gilbert – You’re watching ‘Ask Us Anything About Sarcoma’ from Penn State Health. I’m Scott Gilbert alongside Doctor Collate Pameijer. She’s a surgical oncologist here at the medical center. We welcome your questions and comments. Feel free to add them as a comment below this Facebook post, whether you’re watching this video live or on playback, and we’ll get you an answer. You know, July is Sarcoma Awareness month, so we want to tell you a little bit more about this cancer. Does it tend to surface in some parts of the body that is, say, certain parts, certain structures within the body more than others? Dr. Collette Pameijer – So, sarcoma in the extremities would be the most common location, arms and legs, probably followed by the trunk. A much less common location is within the abdomen. We call those retroperitoneum sarcomas usually. So, those would be the most common areas, far and away in the arms or legs. Scott Gilbert – And if I were to ask you which ages it affects, it sounds like the answer would be all of the above. And I understand we have a multidisciplinary team here at Penn State Health with pediatric physicians, adult physicians, and everything in between. Dr. Collette Pameijer – Yes, it’s so important if you’ve been diagnosed with a sarcoma to have a multidisciplinary team. Even though we talk about sarcoma like it’s one tumor and one tumor type, in fact there are three dozen, at least, different types of sarcoma. And a lot of them are managed in the same way but there are some very important differences for certain types of sarcoma. And so, it’s really important to have a disease team that knows all these important differences. So, our disease team here at Penn State includes myself, an orthopedic oncologist, medical oncology, radiation oncology. We have very experienced and knowledgeable radiologists and pathologists who are so important to making the correct diagnosis. And we also collaborate with our pediatric oncology team because sarcomas are a higher percentage of pediatric cancers than adult cancer. So, they play an important role as well. Scott Gilbert – I read that about all the different types of sarcomas that are out there. Is that unusual to have so many different subtypes of one main type of cancer? Because as you mentioned, there are literally dozens. Dr. Collette Pameijer – If you think about sarcomas in the same way as an adenocarcinoma, probably not. Because, if you talk about an adenocarcinoma, you can talk about breasts, colon, lung. There’s probably three dozen different types of adenocarcinomas as well. So, it probably is about the same. Scott Gilbert – Doctor Collette Pameijer. She welcomes your questions and your comments here on ‘Ask Us Anything About Sarcoma’ from Penn State Health. Just feel free to add them to the comment field below this Facebook post and we’ll get those to her and get you some answers. Because of the symptoms, I’m wondering because– first of all, let’s talk a little bit about the symptoms. Because I’ve heard they can often be mistaken for other conditions, sometimes rather mundane conditions– muscle aches and pains, that type of thing. Dr. Collette Pameijer – That’s absolutely true. And in fact, unfortunately, the average delay between a lump showing up and actually being diagnosed correctly is something like six to eight months. Because people think they have a pulled muscle. Or oftentimes, people recall some sort of injury– they bumped themselves, they hit something with a hammer, or whatever. And that calls their attention to the mass, but they assume that it’s just a hematoma. Or if there’s some skin change, a lot of times they’ll be treated with antibiotics for several rounds before somebody finally realizes there’s really a mass under there and then actually makes the correct diagnosis. So, some sarcomas may have some symptoms. They may have some pain or swelling associated with them. Especially if they grow rapidly. But a lot of times, they’re actually the painless lumps. So, when a patient has a painful lump, I’m actually less worried about it than the painless lump that nobody really notices. Scott Gilbert – Yeah. And so, how do we put people’s minds at ease. Because now people watching this are like ‘Wait, my knee hurts sometimes, my ankle hurts sometimes. My extremities–‘ you know. And then of course, people automatically think, oh geez, could it be something that’s serious? Any way we can kind of put those minds at ease? Dr. Collette Pameijer – I would just say that there are maybe only 13,000 or 14,000 cases of sarcoma in the entire U.S. every year. Scott Gilbert – Which sounds like a lot, but really, relatively speaking, it’s not. Dr. Collette Pameijer – It’s not. By comparison, I think there are going to over 220,000 cases of breast cancer in the U.S. this year. So, more than likely, the lump that you have is not a sarcoma. Obviously if you have any concerns, you should bring it to the attention of your doctor. And the first step would be to obtain some imaging of any sort. We prefer either an MRI or a CAT scan but even an ultrasound is a good place to start. And then we can go from there and see what it looks like. Scott Gilbert – So, that’s how it’s detected, is through a scan where you kind of examine it through imaging? Dr. Collette Pameijer – Yes. That would be the best place to start. And again, with our excellent radiology team, they’re actually very good at discriminating not just sarcoma yes or no, but a lot of times, they can even go as far as to tell us what type of sarcoma, which really you need a biopsy to figure that out, but our radiologists are surprisingly good at figuring it out. Scott Gilbert – And that might be what Karen’s getting at with her question. Her question is ‘What are the lab tests?’. So, I guess when you have a specimen, when you biopsy something, anything else you can tell us about the process? Dr. Collette Pameijer – The lab tests would just be a biopsy of the mass. And generally, today we do a what’s called image guided biopsy. So, that would be the radiologist doing the biopsy. So, we’ll have the patient in let’s say the CAT scanner. And then the CAT scan is used to guide the biopsy so that it’s in a location where we think we’re going to get a good amount of information from the tumor. For example, sometimes tumors have areas of dead tissue inside them. Sometimes they grow so fast, they outgrow their own blood supply. So, parts of the tumor will actually be dead inside. Those parts don’t give us any answer because it just looks like dead tissues. So, that’s not the part that we want to biopsy. We want the radiologist to biopsy the living part of the tumor. So, the imaging guidance is very important for that. Historically, there was a lot of concern about doing image guided biopsies. And historically, we would do open incisional biopsies which was a surgical procedure. But we’ve really gotten away from that. There were concerns about seeding the biopsied tract with the tumor. And that’s very uncommon. I won’t say it can’t ever happen, because I’m sure somebody will have a story that it happened, but it’s so infrequent. And probably a lower risk than doing an open biopsy. Scott Gilbert – And so, I imagine that once that imaging is conducted, that not only tells you what you’re dealing with, but also the best path of treatment. And treatment can range from anything from chemotherapy, radiation, surgery obviously. You’re a surgical oncologist so I know you treat these. Dr. Collette Pameijer – Yes. So, surgery is usually the first– well, let me not say the first step. Surgery is the most common form of treatment for these sarcomas. Again, there are a few important exceptions. So, for example, an Ewing sarcoma we generally don’t treat those with surgery. Those tumors will be treated with a combination of chemotherapy and radiation therapy. But the vast majority of sarcomas, and certainly those that affect adults, will be treated with surgery and radiation therapy. Unfortunately, we don’t have fantastic chemotherapy for sarcoma yet. There are a lot of exciting drugs out there for a lot of tumors. There are a lot of targeted agents. Immunotherapy is a very hot topic right now. And we haven’t seen quite the same progress in sarcoma as we’ve seen with other tumors. So, we’re still waiting for that big breakthrough. Scott Gilbert – That’s interesting because we just did a ‘Ask Us Anything About Liver Cancer’ last week, and that was the case with that as well. Liver cancer is another one that doesn’t respond to chemotherapy at least as of yet in most cases. So, sarcoma is also in that category. Dr. Collette Pameijer – It’s in the same category and it’s very frustrating. And we just keep doing research and, you know, hoping that somebody will find that magic bullet. Scott Gilbert – We welcome your questions for Doctor Collette Pameijer, a surgical oncologist here at Penn State Health. 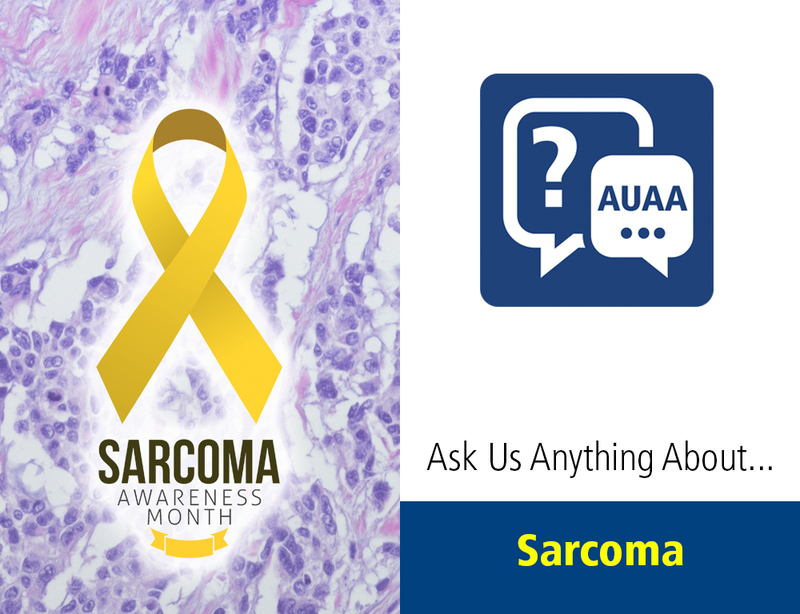 You’re on ‘Ask Us Anything About Sarcoma’. Feel free to post your questions in the comment field and we’ll get those to the doctor and get you some answers. You know, people always want to know, when you talk about cancer, they want to know prognosis. So, when it comes to a diagnosis of sarcoma, obviously I’m sure it depends on exactly when it’s caught, that type of thing. But what’s the range of prognosis we’re looking at? Dr. Collette Pameijer – The prognosis for a lot of patients is actually excellent. I think the survival, if we look at everybody who has sarcoma, the survival is something like 70%, which is not 100% but that’s really pretty good if you compare it to something like pancreatic cancer where their survival is much worse. This survival has a lot to do with the grade of the tumor. Which means how aggressive is the tumor. So, a lot of sarcomas are what we call ‘low grade’, which means that the tumor is– the tissue is fairly normal. It’s clearly not normal because it’s a tumor but it looks a lot like normal tissue. So, for example, a low grade liposarcoma, the cells actually still look a lot like fat cells. Scott Gilbert – So, how do you catch it then if they look like normal cells? Dr. Collette Pameijer – They start that way. Yeah, it’s uncommon for the sarcomas to change their character. If you leave them alone long enough, they will probably turn into something else. But a lot of times, a low grade liposarcoma just stays as a low grade liposarcoma. And these are the masses that people have often had for 10 years and their family keeps bugging them. And they finally have it checked out and it’s a low-grade sarcoma. Scott Gilbert – Even after that point, several years, cure is still a possibility? Dr. Collette Pameijer – Cure is absolutely still a possibility. We worry about different things with low grade verses high grade tumors. With low grade tumors, we worry more about local recurrence, which means it comes back where it started. With the higher-grade tumors, we worry about local recurrence. But those are the tumors that have much more ability to spread throughout the body. So, in those tumors, we worry more about a spread to typically the lungs, sometimes the liver. And that’s when we start using chemotherapy. Dr. Collette Pameijer – Myosarcoma. So, Emily, I’m going to ask you for a little more information about the myosarcoma because I’m not 100% what kind that is. If it’s a leiomyosarcoma, that would be a tumor from muscle. And that type of sarcoma is very hard to treat. Whether we remove it with surgery or not depends on how extensive the tumor is and whether it spread throughout the body. So, if the tumor is spread throughout the body, we typically don’t surgically remove it because it doesn’t really serve any purpose. Scott Gilbert – What do we know at this point about– and we’ll come back to Emily’s question if she’s able to provide us with a bit more information. But in the meantime, we’ll move on to what we know and don’t know about causes for sarcoma. I understand that there is a lot that we still to this day don’t know. Dr. Collette Pameijer – There’s a lot that we don’t know. And I think the vast majority of sarcomas are what I call the bad luck gene. People ask me that all the time and it’s just– they just got it. There are a few risk factors that we do know about. People who have had radiation therapy for breast cancer– really for any reason, it doesn’t matter what the reason is– they can sometimes get sarcomas usually several years after treatment. And those are called radiation related sarcomas. Unfortunately, those tend to be fairly aggressive and also difficult to treat. Some exposures to unusual dyes can cause liver sarcomas. But that’s about it. Sometimes some genetic abnormalities, but the vast majority are not from any known factor. Scott Gilbert – And by the way, Emily did get back to us to follow-up on her question about why is myosarcoma so hard to treat. She said it is indeed a muscle cancer. Dr. Collette Pameijer – Yeah, that’s– the leiomyosarcomas are resistant to chemotherapy. We don’t have a lot that does much good and I can’t really comment on the resectability . If it is resectable, we make every effort to remove the tumor. And we do a lot fewer amputations today than we used to. Historically, sarcoma often meant an amputation of the arm or the leg. Certainly, there are maybe 25% of people who do still require an amputation, just so we can get the entire tumor. But it’s a lot less frequent. A lot of times we can use radiation to avoid the need for an amputation. Scott Gilbert – And given that we don’t know a whole lot about what causes– beyond genetics– it seems like then asking about preventing sarcoma is kind of a moot point. Dr. Collette Pameijer – Yeah, I wouldn’t know what to tell anybody. I know there’s really no way to prevent it that I’m aware of now. Scott Gilbert – Well, great. Thank you for your time and thanks for the great questions today. This has been really informative. We’ll write some links for some more information for you as well in the comment section below this Facebook post. My thanks to Doctor Collette Pameijer. She’s a surgical oncologist here at Penn State Health Melvin S. Hershey Medical Center. And our thanks to you as well for watching ‘Ask Us Anything About Sarcoma’ from Penn State Health.